Epson showed off its nifty little Epson EMP-DM1 portable projector at IFA 2007 in Berlin over the weekend. 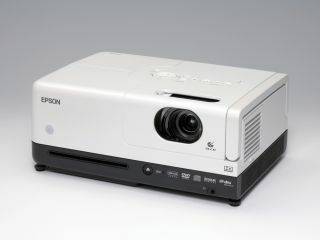 With built-in speakers and a DVD player supporting DivX, the Epson EMP-DM1 [page in Japanese only] is a super compact home cinema projector with a very attractive price tag. For just £500, the Epson EMP-DM1 - launching the concept of 'home cinema-to-go' - is yours. You can easily take the Epson EMP-DM1 projector with you between rooms, or even to a friend's house, as it weighs just 3.8kg. The unit is based on 3LCD technology and shows video at 480p resolution, so no high-definition yet. The DVD player, located at the bottom of the projector, supports DivX and there are also USB slots for hooking up external drives for movie, music and photo playback. DivX ultra, SVCD, MP3, WMA and JPEG formats are supported. Two built-in 8W speakers provide the sound, and you can plug in external units such as digital receivers. You'll find the Epson EMP-DM1 on sale at an electronics retailer near you later on this month.